The following 'Grand Theft Land' article - first posted in November 2013 - was withdrawn by the Save Our Spit Alliance Inc in good faith until legal advice was obtained, following the receipt of a 'Concerns Notice - Defamation Act 2005' on 17th December 2013 from Hickey Lawyers on behalf of their client, Tony Hickey. As a not-for-profit, volunteer community organisation, SOSA welcomes the interest Mr Hickey has taken in our contribution to keeping the Gold Coast community fully informed of decisions being made by their Local Council and the State Government. Mr Hickey has indicated his concerns with our concerns which now concern us. 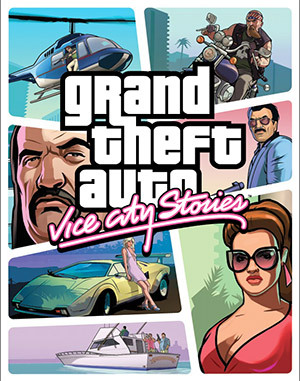 Therefore, the original article has been re-posted as ‘Grand Theft Land 2’ with additional details provided by Hickey Lawyers in a faster, more entertaining and more challenging version based on the videogame of similar title. This whole story started two days before the council election, with the (not at all associated with the current plans) vague and last-minute surprise announcement from Tom Tate that he wants a cruise ship terminal, on crown land, at the Spit. Tom skillfully campaigned as an 'independent', denouncing party affiliation, but in the days after the election, proudly revealed he was actually an LNP blue blood all along and rejoiced with Campbell Newman, celebrating their wins. Tom's lawyer later appealed and won a reprieve despite the evidence. All this for a Mayoral job that pays a little over $200,000 pa? Immediately Tom was pressed by local media and some of his rival candidates, who accused him of eying off public land and to come clean on his real intentions in running for Mayor. Tom denied any ill will, claiming he had absolutely no intention of selling public land. MyGC approached the mayor and their website reported that 'Mr Tate has denied he has his eyes on public assets. He claims the only item on the chopping block is the piece of land in Robina, bought by the current council with the intention of building the controversial Taj Mahal'. Sounds honest, sounds good - a great promise just two days out from the election right? What Cr Tate failed to tell anyone is that under his reign we'd be seeing one of the most aggressive and significant public land grabs ever attempted in the city's history - perhaps the biggest one ever. And as many have since learned, Tom has a real interest in obtaining real estate and changing planning rules, be it for himself, or his friends. It must be noted that changes in council methods recently have meant the 'Local Area Plan' is apparently no longer a rule, but just a guide for development approvals across the city. Tom of course campaigned to protect Spit land from development and to never put any large development on either Wavebreak or The Spit, he was very open about this and it was part of his policy on his website for the months leading up to the election. At 9:00am just 24 hours before the election, a vague cruise terminal policy document was quietly uploaded to his website - it was an empty document, fluffing on about a tiny $30 million dollar rate payer owned building and dock that would barely touch the Spit, it even had a mock picture of a building that was about half the size of most school halls. Nobody, and we mean NOBODY, ever saw or read his policy before voting, most people voted understanding Tom was against development on the Spit or Wavebreak Island. It was perhaps the most underhanded and deceitful move ever seen in this city by a hopeful council aspirant. No mention of giving the entire space away and offering up 75 hectares of our land (yes yours and mine) to his Chinese consortium mates for them to privatise and remove from us forever. No mention to the public of dredging and the environmental impact. No mention that he was willing to give it all away for pretty much free. The state government would do this of course he argued. Everyone immediately thought that surely the state is going to block Tom and his obvious deception of the people? Hell no, they love it and have bought his scheme hook line and sinker, they keep telling us he has a 'mandate' - sorry but did we miss something? People voted for Tom to protect the Spit and Wavebreak and to NOT offload public land!!! 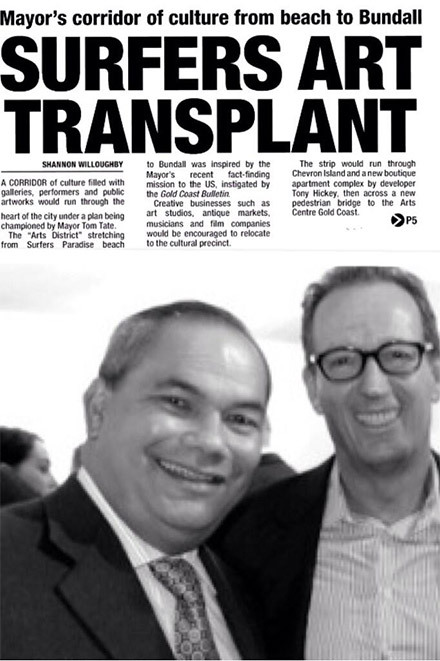 But is hasn't stopped there, soon after in a shock announcement, Tom's friend and 'long-time lawyer Tony Hickey' (Gold Coast Bulletin 06/11/13) was granted approval for a tower development on Chevron Island - Tom cited a perceived conflict of interest, but of course voted anyway to approve it, and Tom has well demonstrated his ability to vote anyway where there's a conflict of interest putting his ethics into question many times. Moving on and we have the now infamous bowls club debacle, the seizing of prime Surfers Paradise real estate by Tom and his friend under the promise of 'we're going to save your bowls club for you' - They managed to drive that into the ground and turn the property over to themselves for a pittance of its real value, an excellent business move at the full expense of the bowls club and their members. Many have labelled that one as a total scam. Oh wait a second, up comes a development application from Tom's company that includes the public owned park land adjacent. Even former mayor Lex Bell admitted he'd never seen anything like it before and was confused as to why anyone would put in a DA on land they don't own. Not to worry, somehow it has worked out for Tom, again, with council now moving to grant the sale of the land and give it to Tom, despite the park never being on the actual approved list for council asset sales. Got enough car parks? Don't need them and it's not a problem when your Tom Tate, a special exemption looks likely for his tower. Moving on, there's the idea of some massive towers from Jewel on the Spit, yep don't worry about the visual amenity, infrastructure, traffic limitations and height limits there, oh yeah some of it will have to go on public land too. Let's look at the promised cultural centre proposal. How does a council that has no money build a $300 million candy land at Evandale? Simple, quietly give away a large chunk of the adjacent public park land to private developers, they can build 6 towers there and help fund the 'fruit tingle tower'. Oh it will have a basketball court and even a water slide reckons Tate. We say well done mate, definitely a win for the developers, err we mean for the people. And of course the precinct has been said to include a new bridge, but it's not to the city centre, rather straight past Tony Hickey's new tower at Chevron - a very convenient plan indeed. Dan Meers for once nailed it in his editorial here http://bit.ly/1dC90VG - I don't know about you, but this looks and sounds an awful lot like a back door fire-sale of public land on the coast, with almost all of it happening behind closed doors and without scrutiny or public approval. Do you remember reading in Tom's campaign material about his great policy to trade massive lots of public land to wealthy mates, associates or interests in exchange for his wild projects and pipe dreams? You don't remember it because it wasn't there, in fact he pretty much said the opposite during the campaign. Finally this week we come to the staggering case of Tom personally assisting beach front land owners in Tugun, arguably attempting to inspire them to take the crown public foreshore and get it for themselves - http://bit.ly/1cxtc6a Tom who usually puts about 6 people between himself and any of the public, miraculously wrote to the residents, taking credit for blocking the removal of illegal structures on public dunes and instructing them on how best to approach the state government to lobby to buy the beach from the people and have it for themselves. To be clear, the residents are doing this themselves, Tom didn't ask them to, but he certainly is doing everything in his power to support them here. Hang on a second, last time I checked, NOBODY owned the beach? Not according to Tom Tate, he's apparently of the opinion that it's up for grabs and should be privatised to keep those pesky public citizens away and he's here to help! Note Tom offers up a line of communication with the residents to his email, but tell us this please, has anyone ever been able to reach Tom on his email? Maybe a concern or comment that you've had honestly and personally answered? I've never met anyone, and he seems to block, auto respond, and side step any email that doesn't involve lumping praise on him or involve being part of his little schemes. Some have gone so far as to argue that the Tugun foreshore privatisation push is just a precursor and a lead up for when the Broadwater cruise terminal proposal fails, and Bob Ell's southern option is activated. It would be a lot easier to secure private land from residents and develop a Tugun cruise terminal than if it was public land. And these are just the ones we know about - what else is Tom keeping from us? Many are saying it - here we 'Joh' again. It's all a bit sickening really, massive and irresponsible short term profiteering from men in power, with no thought of the future and what we leave for our kids. If you're feeling sick about all this (you should be, and you should be alarmed) then don't stop, please don't stop getting on to your councillor, your MP and even the leaders in any way you can, and start thinking now about the next lot of elections. It's the one day you might be able to trade up for a better state, a better city and a better future for your kids. 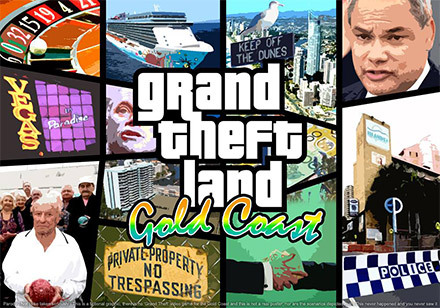 Whilst the images above are a bit of a laugh, it might just be the case that the next big crime/gangster video game to be a worldwide hit could be based on the Gold Coast. Certainly a possibility if we keep heading down this path. We thank Mr Hickey for his contribution to the community debate and for providing interesting new content and insights for 'Grand Theft Land 2'. 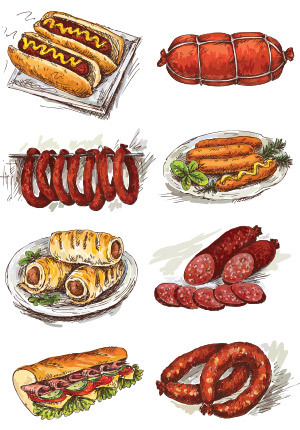 Whether it's a sausage enveloped by pastry and called a 'sausage roll' or it's a sausage nestling in a bun and called a 'hot dog”, the thing in the middle is still a 'sausage”. "So you need to be very careful about some of these proposals, but I am saying there will be no cruise ship terminal on the southern part of the Gold Coast or indeed on any part of the Gold Coast that impacts on the beaches." "We would not be interested in a proposal for a casino on public land on the beach, on any part of the Gold Coast basically - on the sand dunes or something like that. "If someone has a block of private land they are within their rights to make any sort of proposal." We welcome Premier Campbell Newman's assurances and look forward to his declaration being enshrined in legislation along with the recognition of all Gold Coast beaches as a World Surfing Reserve.